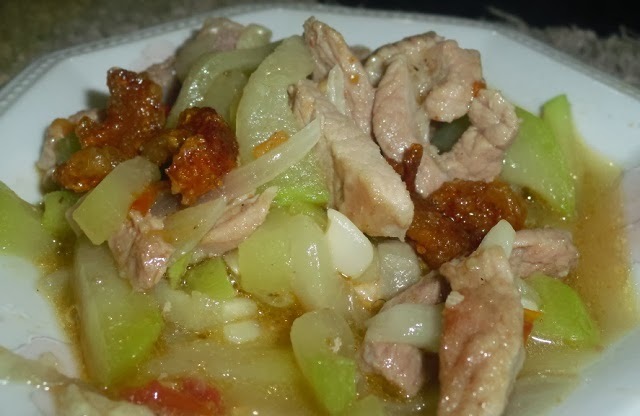 For this soup, the pork is first boiled to render the fat, and then sautéed to add a distinct flavor to the meat. The garlic and peppercorns give it a surprisingly delicious taste. The vegetable upo belongs to the squash family and is also called “long gourd”. Native to Africa but widely grown in the tropics and in some European countries, it tastes mostly bland and watery. Zucchini, summer squash, white gourd, chayote, or winter melon make good substitutes. Upo cooks quickly and has a high nutritional value. 1. Heat 1 tablespoon of the oil in a skillet over medium heat. Add the garlic and sauté until lightly browned. Add the onion and sauté until translucent. Set aside. 2. Add the water to a stockpot and bring to a boil. Add the pork and salt and cook over medium- high heat for 15 minutes. Skim the fat off the top of the broth. Take the pork out of the water using a slotted spoon. Reserve the broth. 3. Heat the remaining 1 tablespoon of oil in a skillet over medium heat. Add the pork and sauté for 10 minutes, or until lightly browned. 4. Return the pork to the stockpot. Add the squash, peppercorns, fish sauce and the sautéed garlic and onion. Cook over medium heat for 30 minutes. 5. Serve hot with rice and the fish sauce.